Grover Norquist tax pledge: Are Republicans breaking the Taxpayer Protection Pledge to face the fiscal cliff? Are Republicans Really Breaking with Grover Norquist? The man behind the GOP’s anti-tax pledge decodes the buzzwords. Grover Norquist speaks at an Americans for Prosperity summit. 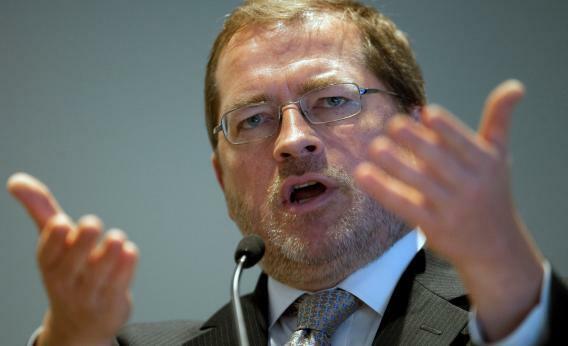 Is Norquist worried about congressional Republicans breaking a pledge not to raise taxes? Grover Norquist is used to it by now. A reporter corners a Republican on the tax extensions/debt deal/fiscal cliff. The reporter asks: Will you break the Taxpayer Protection Pledge and consider raising taxes? The Republican waffles, and the reporter’s next call is to Norquist, the president of Americans of Tax Reform, to see whether a heresy has been committed. This is too easy, which means that it’s wrong. Republicans have mostly mastered the buzzwords of fiscal policy in general and the fiscal cliff specifically. Reporters, for all of the obvious reasons, crank up the headlines and “Breaking News “chyrons, when they hear those buzzwords. But as my colleague John Dickerson has pointed out, the Republicans now denouncing Norquist’s pledge don’t represent a critical mass of tax-hike votes. Graham has talked like this for years, as has Georgia Sen. Saxby Chambliss. And yet there hasn’t been any great compromise that raised taxes. If you were a cynic, you might think that the great GOP moderates were using the pledge to play the press. And if they were doing that, how would they pull it off? Why, they’d use the sorts of words that imply a separation from GOP tax dogma, but in a way that doesn’t actually worry Norquist. I asked Norquist to thumb through the key buzzwords and buzz-phrases and explain why they don’t spook him. Everything is on the table. Norquist gives Republicans a pass on this one. He doesn’t hear it and assume they’re going to serve themselves hot to Chuck Schumer. “This means: ‘I’m terribly reasonable and I’m not committed to anything,’” he says. “What the other person is supposed to hear is: I’m a cheap date.” But it’s fine to treat it as a ruse. Closing loopholes. Paul Ryan got through an entire campaign for vice president by promising to “close tax loopholes” without ever saying which ones he meant. It didn’t really work for him, but it lets Republicans start at ground zero now and suggest that “loopholes” that currently lead to lower taxes for some people might be killable. “Democrats consider the differential on capital gains to be a loophole,” says Norquist. “Republicans consider tax credits for favored industries to be loopholes. Sometimes they’re not talking about the same things. Actually, a loophole is something you shoot at the enemy through.” And until he hears a Republican say he’ll kill a loophole without getting some concession on tax rates, he doesn’t worry. A Simpson-Bowles approach. Norquist spent most of a year attacking the Simpson-Bowles commission, its recommendations, and its adherents. Like Obi-Wan Kenobi, in death Simpson-Bowles has only grown stronger. On Wednesday, Erskine Bowles himself will come to Captiol Hill to meet with John Boehner and give yet more cover for a plan that—in the punditocracy’s understanding—raises tax rates. Norquist doesn’t sweat it. He points to the argument Paul Ryan made when he gave the thumbs-down to Simpson-Bowles: “The revenue increases called for in this proposal are simply too high and threaten to stifle the very growth needed for economic prosperity and fiscal stability.” If “Bowles-Simpson” is code for “I’m reasonable,” the Republican is using it as cover to keep his pledge. But why would Republicans bring up Simpson-Bowles at all? They need to sound reasonable, and they can’t sound like they’re precipitating a crisis. According to a CNN poll, 45 percent of voters are ready to blame Republicans if there’s no spending/tax deal by Dec. 31, and only 34 percent of voters expect to blame Barack Obama. This is the legacy of the debt-limit crisis. This is why Republicans now denounce the pledges and associations that make them look unreasonable. Norquist doesn’t take it personally.